Esports betting at Dafabet is one of the best experiences I have had in a while. This is one of first Asia based Esports bookmakers on the market. Dafabet is a proud sponsor of both Celtic FC and FC Fulham. Dafabet has been established in 2004. Furthermore, they are licensed and fully regulated in the Philipines. This Esports betting bookmaker thrives on security and private environment. There are a lot of things to do at Dafabet. Alongside Esports betting, you can also enjoy betting on other popular sports such as soccer, football, NBA, NHL, NFL, tennis, horse racing and plenty more. Furthermore, you can also enjoy casino games, slots, and of course a live casino. The latest addition to Dafabet is Poker and Lottery. Alongside a huge variety of sports to choose from, Dafabet is providing Esports bettors with a lot of different bonuses. From what we were able to find out, there are over 60 promotions and bonuses in total. However, we are only interested in some of those. Let’s talk about the welcome bonus a bit. A whopping 50% on your first deposit has been put in place, but we will talk more about this down below. Even though Dafabet does not offer a lot of Esports titles to bet on, you should not worry. Esports betting at Dafabet is enjoyable and they have all the popular Esports titles covered. By popular Esports titles, I mean these: League of Legends, Dota 2, CS:GO, Overwatch, Hearthstone, etc. Esports betting at Dafabet comes with a full package. There are all sorts of bets included on their side. The most popular is definitely pre-match betting followed by live betting. Alongside those, you can also place bets on outright winners, but the odds are not so high on these. If you ever encounter a problem with your Esports bets, Dafabet has you covered. When it comes to support system, I have personally never seen more options of reaching out to their staff. However, we will talk more about this down below. As we mentioned above, Dafabet does not provide their Esports bettors with a lot of options, but all the main Esports titles are here. The most popular Esports to bet on Dafabet is CS:GO, Dota 2 and League of Legends. After these titles comes Overwatch and Hearthstone. These are all the Esports games Dafabet offers odds on. When it comes to types of bet, Dafabet is not offering anything spectacular or new. They are sticking with everything that works. To start off with pre-match bets. These are pretty simple, you are basically betting on match-winner. However, there are also special bets included in pre-match betting. This is where Dafabet thrives. Esports betting at Dafabet comes with over 20+ special bets for every single match. After pre-match betting, Dafabet provides live Esports betting. There is not much to say about this sort of betting. It is as common as it gets, and every popular Esports betting bookmaker out there is offering live betting. However, if you decide to place live Esports bet on Dafabet, you will definitely have a great time. There are barely any “greyed” areas on live matches, which makes this bookmaker simply one of the best on the market, at least when it comes to live betting. Last but not least, outright betting has gained a lot of popularity over the course of 2018. Dafabet followed the trends, and they are providing you with the outright odds on each and every popular Esports tournament on the scene. If you want to stay ahead of the competition, you need to be competitive. That being said, Dafabet thrives on their odds. Given the fact that they are based in Asia, they are definitely providing the highest odds on the Asian market. However, they are still highly competitive in the entire world, hence why a lot of Esports betting tipsters are switching to this bookmakers. Esports betting at Dafabet is a great way to increase your profits, mainly because you will get insane odds, but this is not the case for every Esports match out there. However, if you are on the lookout, I assure you that you will be winning a lot more than what you would win with other Esports betting bookmakers. As we mentioned above, 50% on your first deposit up to $80 is an insane deal. There are a couple of things you need to know about this welcome bonus. First of all, even though the bonus says that it is only viable for sports, Esports betting belongs there as well. Another important thing about this welcome bonus is that you will have to use a coupon code in order to claim it. At the moment, the code is “FDB”. A minimum of $10 has to be deposited in order to activate this welcome bonus. Lastly, you will have to wager this bonus for a total of 15 times. There are a lot of ways to deposit money on Dafabet. Given the fact that this Esports betting bookmaker is mainly focused on Asian markets, you will find a lot of deposit methods that are not so usual for European or even American methods. Since there are over 30+ deposit method available, these are the most popular ones: BitCoin, PaySafeCard, Skrill, VISA, MasterCard and Maestro. We talked about how good Dafabet’s support system is, and this is why. There are 7 different support options for your questions and queries. There is no need to talk about all of them in detail, but we will make sure to mention them, just so you can have an insight. Firstly, live chat is available 24/7, 7 days a week. From what we were able to find out, the staff was very professional, and they had all the answers to our questions. Furthermore, we had barely any waiting time. Overall, an excellent live chat with very polite staff. As we mentioned above, there are 7 support methods in total. We went over the popular ones above, but these are all the extra ones. First of all, WhatsApp number has been put in place. 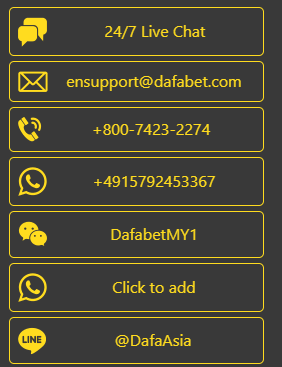 This is something completely new and unique, and I dare to say that Dafabet is the only Esports betting bookmaker who uses something like this. Another great way to reach out is by scanning the QR code provided on the site. This is another great method that is used for the Asian market only.